It's been a while since I've read any poetry. 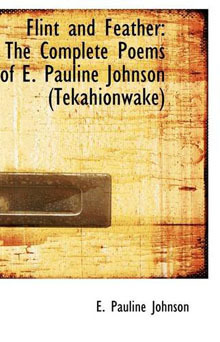 But it was CBC Books' 100 Indigenous Writers to Read that finally inspired me to pick up E. Pauline Johnson's Flint and Feather: The Complete Poems. Written back in 1912, before free form poetry had really taken off, these poems all have defined forms and lots of rhyming. A good many of them, and I would say some of the better ones, are narrative poems. One aspect that I immediately appreciated was her unrestrained emotion. Of course, one might flip that and criticize her for being overly sentimental, but when I first decided that I needed a break from poetry (a few years back I used to read a lot of it) I'd been getting exhausted by the forced obliqueness of all the modern stuff. Perhaps it was because of the emotions, I unfortunately got a little too distracted by the poet herself. (I still remember how frustrating it was for everyone when a guy in my first year poetry class analyzed every poem based on the poet's background.) But there was such a contrast between the attitudes in some poems to others that it was difficult to reconcile they could come from the same person. Take the sentiment expressed in the last stanza of "A Cry From An Indian Wife"
Perhaps the white man's God has willed it so. And compare it to the first stanza of "Canadian Born"
That we were born in Canada beneath the British flag. Of course, anyone's allowed to have mixed feelings about a place, but I suspect Johnson's identity as the daughter of a Mohawk man and white woman must have made her relationship with Canada especially complex.